I am leaving strawberries aside for a minute, while making a tart today. I have mentioned before that I’ve had my fair share of misfortunate crust and shells. And I really hope that they stay in the past. This lack of success always leaves me more determined to master the art of making tarts . I tried something new with this recipe, a method that I’ve never used before. I saw it from David Lebovitz, and I was sure that, if he says so, it will work. Instead of incorporating cold butter into the flour, you let the butter together with the oil, water, sugar and salt melt in the oven until it starts browning and then quickly mix it with the flour. Quite different then the common understanding, but it really produced one of the best tarts that I’ve made. It was not perfect, and the sides did shrunk a little, but it was crunchy and it kept it form graciously. I blame myself for the flaws because I tend to mess up when it comes to tart doughs, and I am still very happy with the result. I recommend you check David’s instructions if you decide to make it. 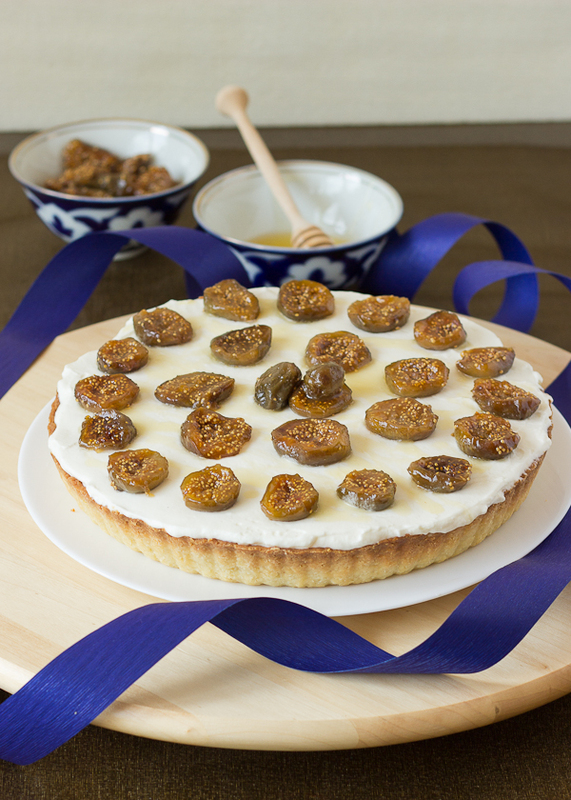 The filling of the tart is a combination of mascarpone, yogurt and whipped cream and on the top are the honey roasted figs. It’s a no fuss filling with an amazing taste and texture- creamy and light at the same time. 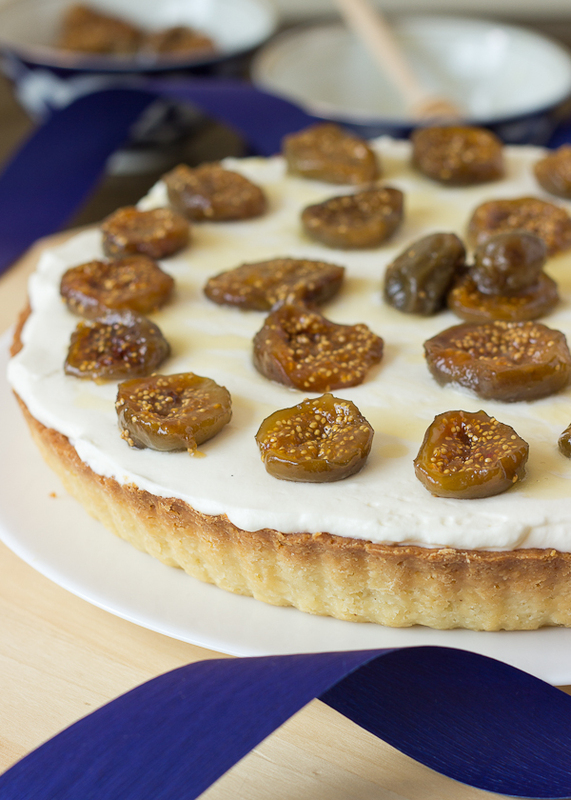 The sweetness of the honey and figs compliment the crunchy tart and the rich center beautifully. Preheat your oven to 210°C/410°F. Mix the butter, oil, water, sugar and salt in a large stainless steal bowl and place it in the oven. Let the mixture stay in the oven until the butter is completely meted and starts to brown around the edges. Remove from the oven and dump in the flour. Mix quickly using a wire whisk until completely incorporated. Let the tough cool for a few minutes and transfer it to a 26 cm/10 inch tart pan. With your fingers to distribute the dough evenly on the bottom and up the sides of the tart pan. Place the tart in the oven and bake until golden all over, approximately 20 minutes. Place the mascarpone and sugar in a bowl and use a mixer to beat it on medium speed until smooth, approximately 2 minutes. Add the yogurt and beat until incorporated. Place the cold heavy cream in a separate bowl and whip on high speed until stiff peaks form. Gently fold the cream into the mascarpone mixture. Fill the cooled tart shell with the cream. 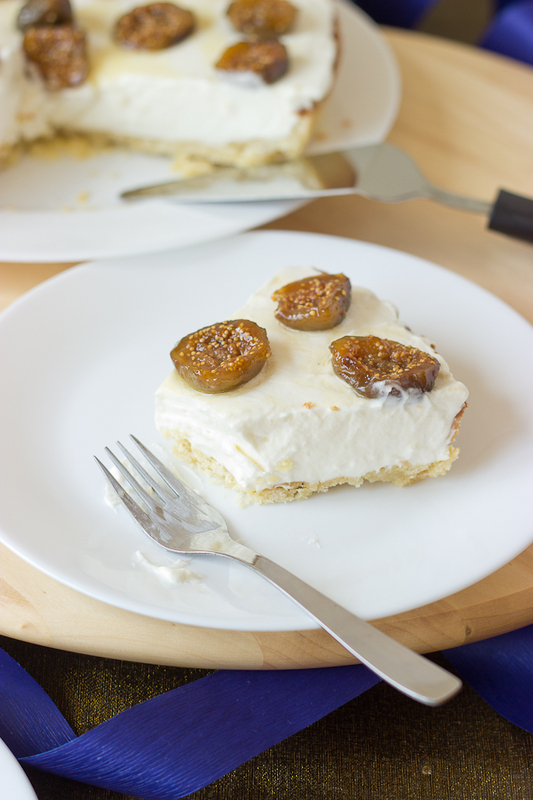 Slice the figs in two. In a large skillet heat the honey and water over medium heat for a few minutes until it bubbles and liquids is slightly reduced. 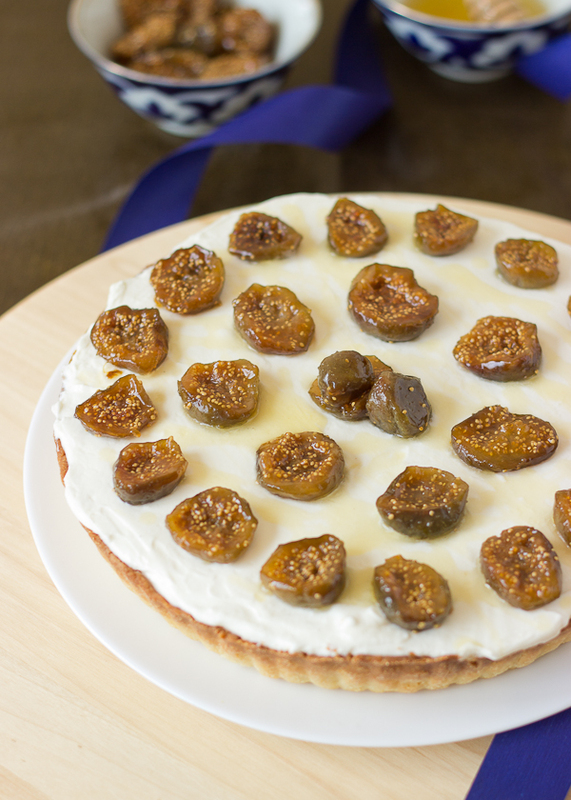 Place the figs over the honey mixture and cook for 2-3 minutes on each side. 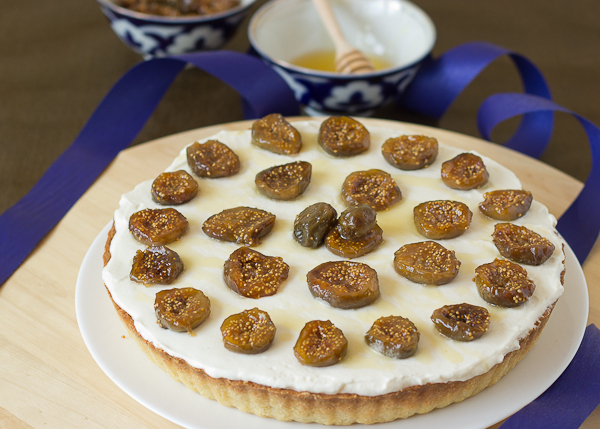 Arrange the figs over the mascarpone filling.If you like you can drizzle more honey over the figs.